Keep Your Heart Healthy: Acai berries are extremely high in anthocyanins, an antioxidant associated with lowering cholesterol levels in the bloodstream. It also may prevent blood clots, relaxing the blood vessels, and improving overall blood circulation. Benefits for skin: Adding collagen to the diet has been a good addition to improvement of your skin. Collagen helps your skin maintain its elasticity. This prevents your face from developing wrinkles every time you make an expression and accounts for the youthful appearance of younger skin. Build bone strength: The loss of bone mass is one of the most common signs of aging. Collagen may help the absorption of calcium and other minerals that are essential for bone strength. Additionally, collagen supplementation may stimulate collagen synthesis in the bones by promoting bone-building cells. Reduces Appetite: Acai is high in essential nutrients that may help to reduce your appetite and control your food cravings. This in turn will help you to maintain your weight, or lose weight if you are overweight. 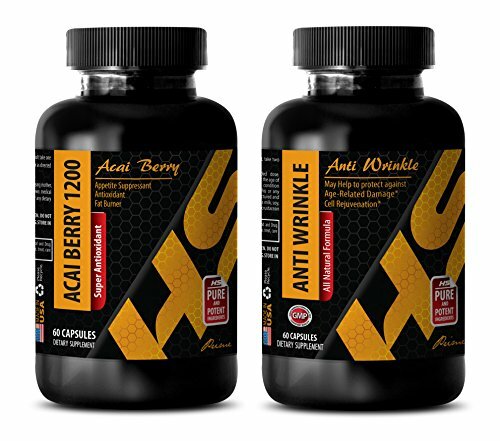 ACAIBERRY - ANTIWRINKLE COMBO: Acai berry offers several health benefits. Some of them include supply of essential amino acids, high dietary fiber which may help in digestion, provide antioxidants and may supply essential fatty acids that are good for brain and eyesight development. Acai berries come from Acai palm tree which is indigenous to Central and South American countries such as Belize, Costa Rica, El Salvador, Guatemala, Panama, Brazil and Peru. Our anti-wrinkle supplementation may provide a multitude of health benefits while also helping to improve the visible health of skin. It may also be helpful to elevate mood, support healthy weight loss and maintain cardiovascular health. Good source of antioxidants: The amount of antioxidants found in Acai berries is high. These antioxidants may be useful in controlling the outside activity in the body. The antioxidants in can help boost cellular levels of glutathione, the body's most important antioxidant to overall health and longevity. Supports Weight Loss: Collagen may support weight loss in a unique way - by naturally inhibiting the main elements in the gut. Adding collagen to your diet can curb cravings and make it through to your next meal. Our herbal acai berry supplement may be useful in helping you lose weight.